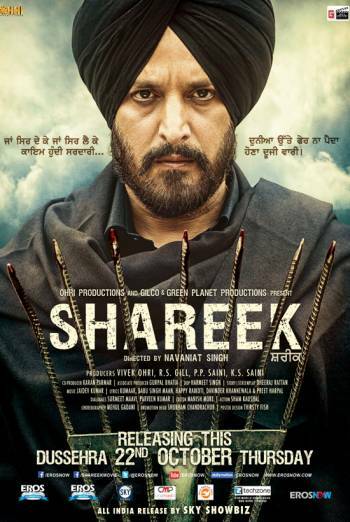 Summary SHAREEK is a subtitled Punjabi language drama about a simmering feud between two branches of the same family. Cut This work was cut. The cuts were made at the request of the distributor to achieve a particular category. To obtain this category cuts of 2m 44s were required. Details of cuts below may contain spoilers or plot details. SHAREEK is a subtitled Punjabi language drama about a simmering feud between two branches of the same family. Moderate violence includes fight sequences in which punches and kicks are exchanged. In other scenes, a man is shot in the head, a man is beaten and strangled, and a man is stabbed in the stomach with a metal bar. There is infrequent mild bad language, including uses of 'bloody' and 'sala'. The company chose to reduce scenes of strong violence (removing sight of injury detail and blood spurts as characters are shot, stabbed and crushed) in order to obtain a 12A classification. The cuts were made in accordance with BBFC Guidelines and policy. An uncut 15 was available to the company.